“Why do we need a change in classroom practices”? cited are varied, low family income, health problems, transfer situations etc. All these are circumstantial reasons but the most surprising rather disappointing one is “loss in interest towards studies”. An interesting thing to be noticed here is that although technology has the power to totally reform the definition of a “classroom” (where it is not just a room within four walls, it is not where teacher teaches, and it is not the a place depicting duty bound by chains), still the inefficient use of the same or rather the lack of knowledge of technology pulls one back to square one. The answer to this really depends on various factors like age of students, family’s economic and social condition etc. However, we can broadly observe the results by dividing the classrooms as primary, secondary, higher secondary and college. Primary students need personal care and attention. With the need of freedom to thinking and continuous requirement of activities, it is actually considered the most difficult for any teacher. iPad inspires creativity and hands-on learning with features you won’t find in any other educational tool — on a device that students really want to use. Powerful apps from the App Store like iTunes U and iBooks let students engage with content in interactive ways, find information in an instant and access an entire library wherever they go. Use of iPads or other devices for sketching and other creative class-works can keep the children engaged and in the process teaching them analytical problem solving and creativity inculcation. Using informative videos, animations, and humorous videos to generate curiosity as well as interest in the children. Strategically designed Games to engage children into learning numbers, alphabets etc. E-mails to parents regarding notices, changes in schedule, any other discussions. This is highly needed because if you see a primary children’s face, there is his/her guardian’s mind in the shadow demanding news for every step. Secondary and higher secondary students need lot of grooming, variety in study for each field and more interaction. The concept of "Connected Learning" is at the centre of a new theory for these students. According to Dr. Mizuko Ito, a leader in the field of Connected Learning and a professor at the University of California, Irvine, “It is a model of learning that holds out the possibility of re-imagining the experience of education in the Information Age that draws on the power of today's technology to fuse young people's interests, friendships and academic achievement”. An example of Connected Learning may be when a teacher asks a student to do a report on their favourite video game, or if a kid who likes to draw on the computer creates the signs and banners for a classroom event. Use an online grading system for instant report and transparency between student and parents. Create a Class Blog or Wiki is much better than writing a diary from the perspective of a character or famous person. It will give them global exposure and highly interactive discussions. Real World Applications through latest researches and online conferences - Why am I learning this? Because it is on the test, is not the best answer. Giving a student examples of when or how they might apply a skill in real life, makes it more meaningful. Sharing Content Online extensively so that other under privileged students can also collaborate on a shared project, or posting opinions, creating forums, websites for everyone to access and share knowledge. Having Fun with Social media like Twitter, to contact well-known personalities or to create hashtags about a relevant topic and see if it can spawn participation from external parties. 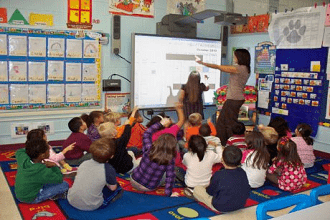 Thus one thing is certain, there is a requirement of changing classroom teaching techniques. The fact is so prominent that all around the world governments are taking major steps to reform their educational sectors, globalize their teaching sector and spend major cut in enhancing technology in education. For solution, the question should be framed as, what is the big/major change needed in schools, universities today in the 21st century, that can increase the engagement of students by giving them regular tasks, letting them do their own works in groups, a supply of knowledge bank that can be accessed anywhere, high level of interaction even outside the classrooms and last but not the least, enjoying the whole phenomenon of studying? Technology is the simplest answer, as we can verify today. But using it efficiently and for the required purpose still has a wide horizon.